Daughters Are for Others, 2006, by Shalinee Kumari (Indian, b. 1985). Ink and colors on paper. Asian Art Museum of San Francisco, Museum purchase, Mortimer-Harvey Fund, 2018.7. © Shalinee Kumari. Photograph © Asian Art Museum of San Francisco. 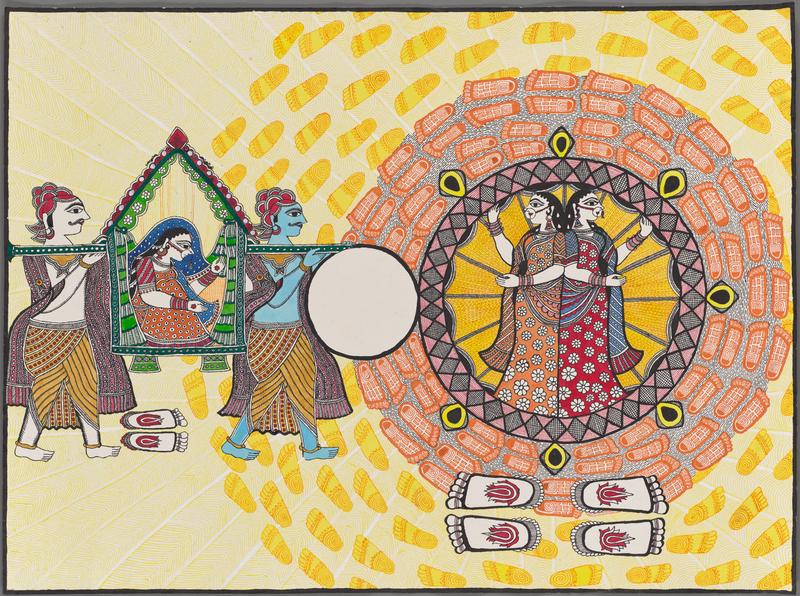 This talk in conjunction with the special exhibition of Mithila paintings at the Asian Art Museum will delve into the history and culture of this unique form of 'folk art' from the Mithila region of Bihar. Since at least the 14th century, women of this region have painted gods, goddesses and icons of fertility on the walls of their homes. In the late 60's they began transferring them to paper. They now include episodes from the ancient epics, famous narratives and folk tales, which demonstrates the vitality and growth of this art form in the 21st century. Malini Bakhshi, a product designer, has taught design and typography at the Academy of Art University and has worked in the technology industry. She founded Pink Mango to encourage the appreciation of contemporary Indian art and has been involved in organizing exhibitions of Mithila paintings around northern California.